I have two teenagers that have grown up in the Facebook/Playstation age and it makes me sad. I think Mrs. Scary and I have done better than most in trying to raise our children in the “old school” way but modern society is a powerful enemy and it wears you down bit by bit to a point when you suddenly think that “only” two hours of online gaming is progress. I have a hard time coming down hard on the culprit, my son, because he’s otherwise very active, football, soccer, baseball, hockey, skiing/snowboarding, hunting/fishing and scuba diving. But it just bugs the living crap out of me to see him sitting in front of that damn idiot screen for hours at a time when he should be out…I don’t know… recreating my childhood or something. He’s got a great head on his shoulders and he wants to do great things, maybe it’s the old man in me talking, but in MY DAY we didn’t waste our time playing video games. In my day we built tree houses and submarines. Or at least tried to build a submarine…it’s a long story. Of course when my best friend Lee got PONG we spent hours hitting that little white dot back and forth but that’s totally different. At least I caught him studying my FAA power plant test guide last week, maybe there’s some hope for him yet. I never made it to airborne school, I went to Air Assault School where we learned to rappel out of helicopters and was MUCH more difficult than dope on a rope school, but I digress. A night jump with a round parachute and loaded down with a ton of gear is scary enough, doing it into an enemy held airfield is………..well I can’t think of a big enough word for it but it takes big brass ones to to do what these guys do. AIRBORNE! 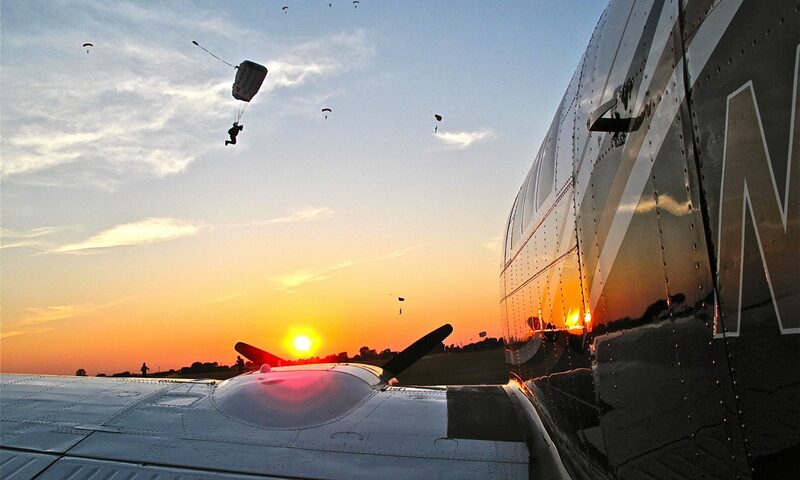 My skydiving school opens this Friday and having not made a jump in five months I’m really ready to grab some air. The video is a little long, almost ten minutes, but totally worth the time. With the technology available to the movie industry these days I have high hopes for the future of military flying movies.